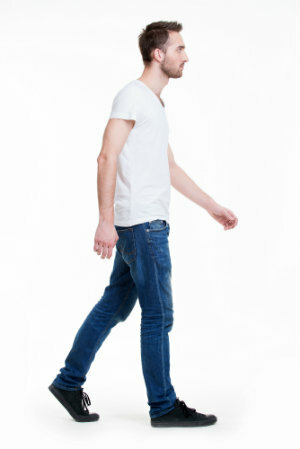 Should You Have a Podiatrist Watch You Walk? The opening moments of the 1977 film Saturday Night Fever contains one of the most famous scenes in movie history: the camera zooms in on John Travolta’s feet as he swaggers down 86th Street in Brooklyn in his dancing shoes. It’s a memorable sequence, perhaps especially so for a podiatrist—watching people walk is part of what we do for a living! You may not strut like Travolta (and in fact, you probably shouldn’t—especially not in those disco platform shoes), but that doesn’t mean we aren’t interested in carefully watching you stand, walk, and move about. Although there are certain commonalities shared by all people who walk—a process known as the gait cycle—everybody takes their steps a little differently. The study of how people, muscles, and joints move is called biomechanics, and it’s an important part of what we do. Many people overpronate to varying degrees, meaning their ankles roll too far inward while toes point a bit outward. A few people underpronate, which is essentially the opposite. Stride lengths, heel strikes, and push offs vary from person to person, while factors like flat feet, bunions, or arthritis can alter the way one moves. Although there’s no one fool-proof “healthy” way to walk, paying close attention to the little details can help a trained podiatrist diagnose a condition, predict which future problems might be most likely to emerge (and help you prevent them from happening), recommend shoes or treatment options to help you better manage your foot pain, and more. So, is foot pain preventing you from getting from place to place the way you want to? Stop in at our office in Palm Desert and let Dr. Harvey Danciger see your walk. From orthotics and physical therapy to laser treatment or surgery, he has the tools and training you need to keep that swagger in your step. Request an appointment online, or give us a call at 760-568-0108.